I don’t think it was my imagination. As the National Geographic’s ship Explorer crossed the Antarctic Circle, the wind suddenly picked up, and the temperature dropped precipitously. After sailing down the Antarctic Peninsula for five days in balmy summer conditions of 25oF, the sudden blast of frigid air signaled that I had truly arrived at “the last place on earth,” the name given to Antarctica by author Roland Huntford in his masterful book on the race to the South Pole between Roald Amundsen and Robert Scott. That book was the reason I was standing on the deck of the ship, covered from head to toe in multiple layers of down and wool, drinking in the vast emptiness of the southernmost continent. The spirit of adventure, inhuman endurance and ingenuity that was required to reach the pole inspired me to travel to Antarctica with my sister, Nancy, but it could also be that Canadians just like cold places. The Captain had promised to sail south until he could go no further, and he proved as good as his word. Immediately ahead was an enormous expanse of sea ice that he ploughed straight into, eventually bringing the ship to a grinding halt. There to greet us were two Adelie penguins, who waddled over and watched with keen interest – and no fear - as the landing party tested the ice. Once the crew knew it was safe to disembark, my fellow travelers spent the next hour in brilliant sunshine, racing over the snow-packed ice, chasing and being chased by frisky penguins. It was one of the most glorious experiences of my life. 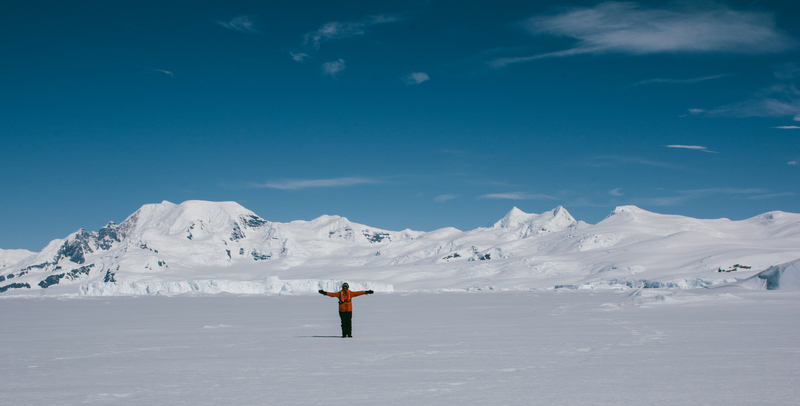 Antarctica is beautiful and forbidding in equal measure. It is difficult to capture in words why it leaves everyone who visits with such a sense of awe. The words “wild,” “empty,” and “untamed” compete with “glorious,” “enchanting” and “breathtaking.” Just getting there can be a challenge, as one must navigate the Drake Passage, fondly known by sailors as the “Drake Shake” for its notorious and unpredictable waves. Even as intrepid a traveler as Charles Darwin was violently seasick on his passage between South America and Antarctica. The “Shake” is worth it, as the shores of the Antarctic Peninsula are anything but barren in January. They team with wildlife, including many varieties of penguins, sea lions, whales and sea birds. Penguins are just as adorable as Disney advertises. No matter how many you encounter – and by the end of the week the numbers were in the thousands – they charm and delight. 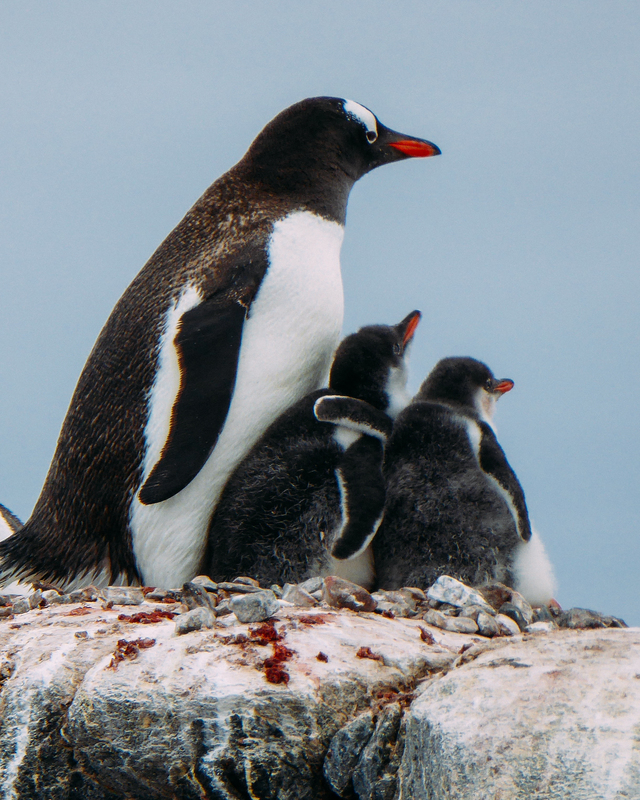 January is breeding season, and we arrived to see hundreds of loud, furry and demanding chicks who spend most of their time nestled between the feet of their mothers and fathers, as the two pair-bonded parents trade off child care and “shopping” in the Antarctic waters for food. I was not prepared for my infatuation with icebergs. Icebergs were everywhere; they dotted the landscape in every imaginable shape, size and color, creating vistas of unimaginable beauty. We learned that the pure white ones were composed primarily of seawater, while the green, blue, turquoise and yellow ones had been built up over long periods of time from snowfall in glaciers that calve off the land. The blue color comes from small air bubbles, which become condensed over time, absorb red and yellow light, while reflecting blue light. One of my favorite images of the voyage was a lone “sad sack” of a penguin moseying across a sparkling turquoise landscape. As the only uninhabited continent, except for research stations, Antarctica is governed by a consortium of 28 nations that collectively have agreed to conduct research, protect the delicate ecosystem and prohibit the exploitation of natural resources. The number of ships that are allowed to sail in the vicinity of the continent is tightly regulated. Sadly they are unable to prevent the accelerating melt of the ice shelves, floating extensions of land ice projecting into the sea. 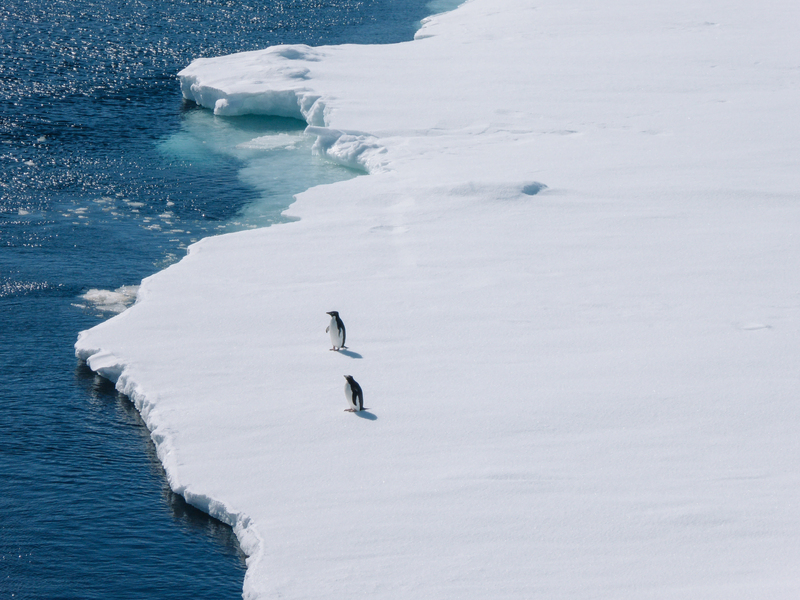 One reason to travel to Antarctica now is that it may not be around in another century.